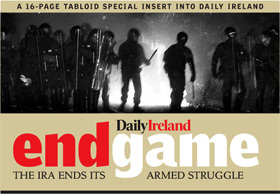 eye-witness accounts of Bloody Sunday and other atrocities and packed with photographs of a country wracked by 30 years of civil war. Journalists, photographers and camera crews have followed the conflict between Protestants and Catholics in Northern Ireland closely for many years, but attention has rarely been given to the consequences the conflict had for the urban environment. 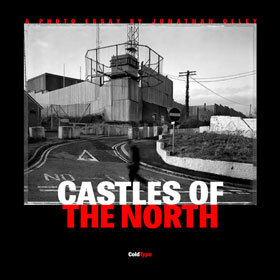 Photographer Jonathan Olley photographed the British army s heavily-armed observation posts and forts which define the street scene in Northern Ireland. They loom over shops, pubs and fish and chip shops like modern castles. Now that the army is withdrawing as a part of the peace process, the buildings and towers are being demolished brick by brick. The Real IRA bombing which killed 29 people at Omagh in Northern Ireland was the last - and worst - major attack during the 30 year war between the province's Protestants and Catholic factions. 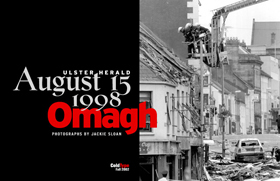 The images in this 10-page essay are the work of Ulster Herald photorapher Jackie Sloan.